When the whole body is out of balance, one result may be Hypertension or high blood pressure. According to the principles of Traditional Chinese Medicine (TCM), this particular condition is related to the liver, heart, and kidney not functioning properly. When high blood pressure is evident, TCM recognizes and treats the related symptoms of this including headache, stiff neck, and dizziness. Other related symptoms may include irritability, excess body heat, red eyes and face, insomnia, and high pitched ringing in one or both ears. In TCM, these symptoms are recognized as a dysfunction in liver energy (liver Qi). Liver Qi functions to facilitate a free and smooth flow of body energy to normalize the function of our body organs. In the case of high blood pressure (hypertension), the flow of the liver Qi is reversed upward and stuck in the upper part of the body, particularly in the head. As a result, liver heat is created constantly. Heat has the nature of “Yang” energy in the terms of TCM and consequently, the rise of Liver Qi (heat) is termed “Liver Yang Ascending”. Because the rise of blood pressure coincides with the Liver Yang Ascending, Liver Yang Ascending is regarded as the direct cause of high blood pressure and is treated accordingly. Healing is achieved by reversing the Liver Yang ascending direction and bringing it back into balance through both acupuncture and herbs. In addition to liver dysfunction, hypertension is also related to a dysfunction in both the kidneys and the heart. 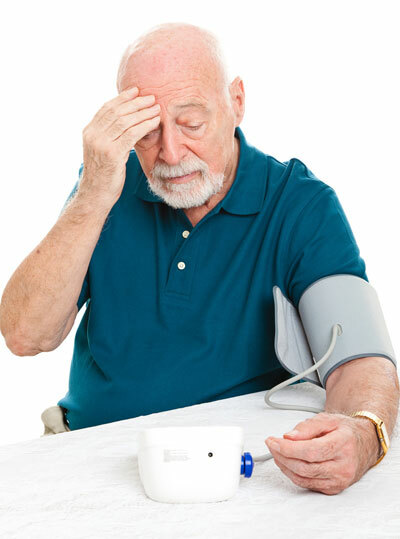 This condition is the usual result of a long period of uncontrollable hypertension. The symptoms that relate to heart dysfunction include shortness of breath, heart palpitations, chest tightness, fatigue, edema, etc. The symptoms that relate to kidney dysfunction include frequent urination, especially at night, swollen legs or feet, lower back pain, weakness or pain in the knees, dry mouth, dry eyes, and a low ringing tone in the ears. As a result of long-term hypertension, the human body may produce two pathogenic factors. Blood stasis due to long time poor blood circulation. The patient may complain of body aches, cold limbs, leg cramps, poor memory, and numbness or tingling sensations in their body. Phlegm toxin is produced by the excessive liver Qi invading the spleen Qi. The spleen Qi is unable to control the normal body liquid metabolism. Therefore, dampness or phlegm toxin is formed in the body. As this occurs, the patient may experience dizziness, light-headedness, numbness, tingling sensations, and throat mucous or post-nasal drip. In a clinical setting, a patient is most likely to have high cholesterol and arteriosclerosis problems while the blood stasis and phlegm toxins are being formed. As a direct result of these conditions, the patient has increased risk of developing a stroke or heart attack. The goal of TCM treatment is to bring all these organs back into balance and harmony and keep the body’s Qi flowing freely and smoothly. The treatment process utilizes both acupuncture and a formula of appropriate Chinese medicinal herbs. The acupuncture treatment points include LI 11 (Xiu Chi), ST 36 (Zu San Li), GB 20 (Feng Chi), LR 3 (Tai Chong), and L 14 (He Gu). Two or three additional points are utilized for each additional symptom such as with severe headache, insomnia, palpitation, frequent urination or swellings of the feet or legs, poor blood circulation or phlegm syndrome. Generally, the needles remain in place for 30-45 minutes for each acupuncture session. In order to achieve the best effect, the patient must feel the needle sensation. Chinese doctors call this sensation “Gain Qi”. The sensation can be described as heaviness or a pressure feeling around the needle sites or along the energy (Qi) pathway called a meridian. The more sensation a patient has, the better the results. The sensation is not felt as pain. In my clinic, those patients who initially fear the needles become comfortable with them and come to enjoy the session. Generally two to three acupuncture treatments per week are required based on the patient’s blood pressure level and his or her general health condition in the first three to five months. In most cases, Chinese herbs are also required (this will be explained in next section). During the acupuncture and/or Chinese herbal medicine treatments, the patient should continue taking any medications (pills) prescribed by their physician until the blood pressure level returns to an normal range (approximately 120/80) and remains there for at least 8 weeks. This is required because the acupuncture and Chinese medicinal herbs and your chemical pills must be maintained in the same treatment level to prevent a rebound in the blood pressure. After that time, your Chinese doctor may assist you in gradually reducing your dependency on chemical pill only with your primary physician’s consent. In most cases, it is necessary for the patient to take the Chinese medicinal herbs daily to enhance the effect of the treatment. The herbal medicine is a food supplement that will supply the material that our body needs to keep normal functioning and helping our body to detoxify from harmful substances. The herbal formulae are specifically prescribed for each patient according to the differential diagnosis based on the patient’s general condition and symptoms as described above. The Chinese herb formulas may consist of 12 or more herbs and their combinations, which are precisely balanced by the Chinese doctor to work together to correct the energy (Qi) imbalances that have created the high blood pressure condition. When acupuncture and medicinal herb formulas are used together, both forms of treatment become more effective. Using these methods of treatment, Traditional Chinese Medicine not only lowers the high blood pressure levels to normal ranges and treats related symptoms and maintains balanced and normalized organ function, it also effectively treats the root causes of the problem. Because TCM has developed and tested these methods for more than five thousand years, they are safe, highly effective, and free of side effects. Because TCM addresses the root causes of high blood pressure and removes its related symptoms as well, the complete healing process may take a few months to a year depending on the patient’s hypertension history and severity. However, with my unique acupuncture technique and efficient Chinese herbal remedy, patients will notice their blood pressure can be under control in a matter of few weeks. Most patients find it is worth the investment of a yearlong process to combine acupuncture and herbal treatment to achieve a healthy life condition free of a dependency on medications (chemical pills) and their possible side effects. With my knowledge and your cooperation, I believe that we can make your life healthier and happier.